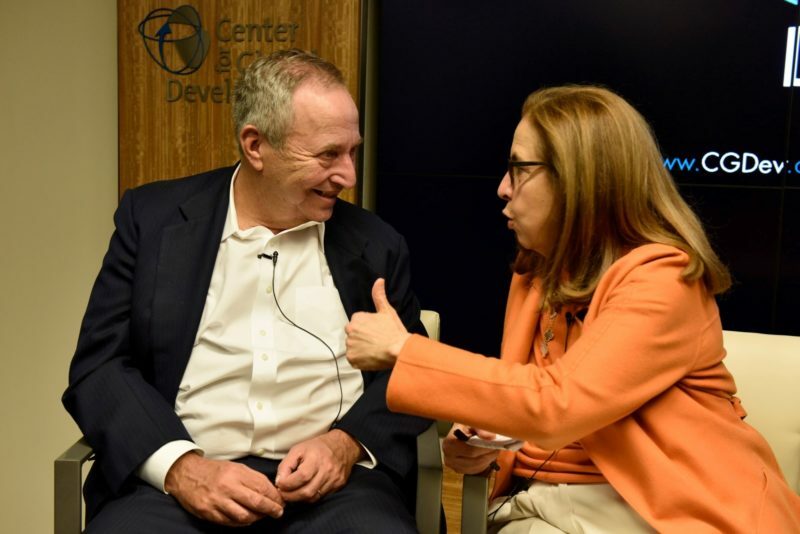 On Thursday, April 11, the Center for Global Development (CGD) and Bretton Woods Committee hosted a panel discussion on “The Future of the World Bank Under the Next President.” The event was held at the headquarters of CGD in Washington, DC. The discussion, held on the sidelines of the World Bank and IMF Spring Meetings, explored which issues should be at the top of the agenda of David Malpass, the new President of the World Bank. Panelists talked about what advice they would give to Malpass with respect to managing the World Bank, making its operations more efficient, improving its development impact, and responding to changes in the economies of the developing world. Host speakers for the event were Masood Ahmed, President of the Center for Global Development, and William R. Rhodes, Advisory Council Member of the Bretton Woods Committee. Panelists were: Afsaneh Beschloss, Founder and CEO of RockCreek; Lawrence H. Summers, Charles W. Eliot Professor of Harvard University and Chairman of the Board, Center for Global Development; Minouche Shafik, Director of the London School of Economics and Political Science; Sri Mulyani Indrawati, Minister of Finance for Indonesia; and Nicholas Stern, IG Patel Professor of Economics and Government at the London School of Economics and Political Science. The moderator was Josh Zumbrun, reporter for the Wall Street Journal. Afsaneh Beschloss and Larry Summers at the Center for Global Development Event, "The Future of the World Bank Under the Next President." In the hour-long discussion, the panelists discussed a broad spectrum of issues ranging from what the World Bank president should do in his first 100 days (do not reorganize; do not badmouth the institution) to challenges at the center of the World Bank’s business model (embedded subsidies in the pricing of its loans; the extent of lending in China and other higher-income countries). The panelists agreed that the World Bank has a unique, powerful role in addressing global public goods such as climate change, but that it could much more to sharpen and articulate its comparative advantages relative to other development institutions.